For a host of reasons, it is vital for employers to get compliance with OSHA’s standard for the “control of hazardous energy (Lockout/Tagout)” (29 C.F.R. 1910.147) (LOTO) right, but it also happens to be one of the least understood and most often botched set of regulatory requirements in OSHA’s portfolio of standards. [Part 2]: 5 common mistakes employers make implementing LOTO requirements. As we discussed in Part 1 of this two-part article, there are five important OSHA enforcement reasons why it is vital for employers to truly grasp OSHA’s regulatory requirements for lockout/tagout (LOTO) and implement them. For a detailed discussion about those reasons, check out Part 1 of this two-part article. This part details the five most common mistakes and misunderstandings associated with OSHA’s regulatory requirements for LOTO. Normal production operations are not covered by the LOTO standard. Rather, the requirements of OSHA’s LOTO standard kick in during servicing and/or maintenance, or any production activity that requires an employee to remove or bypass a guard or other safety device, or if an employee is required to place any part of his or her body into an area on a machine or piece of equipment where work is performed upon the material being processed. Otherwise, the employer is expected to install and maintain appropriate guards that protect employees as required by 1910.212, OSHA’s machine guarding standard. While the LOTO and machine guarding standards tend to complement each other—one protects employees during normal production operations (guarding), while the other protects employees during servicing or maintenance (LOTO). Technically, OSHA may not cite the same conduct as a concurrent violation of both standards. While the Agency may find and cite deficient aspects of an employer’s LOTO program while investigating an accident resulting in an amputation, for example, it cannot establish that the accident itself resulted from a violation of both 1910.147 and 1910.212; it must be one or the other. In short, the LOTO standard applies to general industry workers who are performing servicing and/or maintenance on machines or equipment, and who by virtue of those activities can be exposed to the unexpected energization, startup, or release of hazardous energy from the machines or equipment. Servicing and/or maintenance activities typically include tasks such as lubrication, cleaning, unjamming, making adjustments, or tool changes. Typically, these activities are distinct from an employee’s normal—production—activities. Of course, if an individual is employed as a maintenance worker or repair-person, then performing servicing and/or maintenance is part of that employee’s normal activities. One of several common mistakes employers make in applying the scope of the LOTO standard is to focus too narrowly on one type of hazardous energy. Specifically, we have found that employers do a very good job of addressing hazardous electrical energy in their LOTO programs, but LOTO applies to every type of hazardous energy, including mechanical, thermal, hydraulic, pneumatic and gravity. That means employers must ensure employees who are performing servicing or maintenance on an industrial oven are protected from heat energy, that employees repairing a power press are protected from the gravity forces of a press in the upright position, and employees fixing a piece of air-powered equipment are safeguarded from an unanticipated release of air. One final area of confusion in the scope of application of LOTO relates to the term “unexpected energization.” As of today, the requirements of OSHA’s LOTO standard do not apply if workers are not exposed to unexpected energization. That means that even while an employee is performing maintenance in the guts of a machine, LOTO is not required if employees would become aware the machine was about to energize. For example, if the machine automatically sounds an alarm flashes strobe lights for several seconds before a piece of equipment begins to operate, and there is no mechanical way for those warnings to be defeated, then it cannot be said that energization is unexpected. However, OSHA appears to be pushing ahead with a rulemaking that would strip the LOTO rule of that flexibility. Specifically, OSHA’s latest Regulatory Agenda maintains the current version of the Standards Improvement Project (SIP IV), a kind of ongoing rulemaking the Agency has used for years to streamline, clarify, and update workplace safety standards to remove duplicative, unnecessary, or inconsistent safety and health regulations. OSHA initiated SIP in 1995 in response to Pres. Clinton’s Executive Order: “Improving Regulations and Regulatory Review.” OSHA was specifically instructed to make non-controversial changes to requirements in confusing, outdated, duplicative, or inconsistent standards. SIP IV, however, contains a provision about LOTO that does not meet the spirit of SIP. Specifically, OSHA proposed to remove the term “unexpected energization” from the LOTO standard, but not for clarification or simplification. Rather, OSHA is attempting to use the SIP tool, which was intended for minor, non-controversial rule changes, to overrule the Sixth Circuit Federal Court of Appeals 1996 decision in Reich v. GMC (“GM-Delco case”). For twenty years now, employers have relied on this interpretation of “unexpected energization” in the GM-Delco case. It is well understood and its impact on operations is significant. OSHA now asserts that a change by SIP is needed to return the scope of LOTO to OSHA’s original intent, to ensure LOTO is used instead of less effective warning systems, and to reduce the burden on compliance officers who have needed to perform a case-by-case assessment of warning schemes. Such a change, however, is far from non-controversial, is certainly not minor, and does not clarify any present confusion about application of the standard. Year after year, the most frequently cited violation of the LOTO standard—often twice as many violations as the next most commonly cited provision—is missing and/or inadequate machine-specific LOTO procedures (MSPs) under 1910.147(c)(4). Interestingly, far more employers are cited for missing and/or inadequate MSPs under 1910.147(c)(4) than for not having a LOTO program. understand the specific steps he or she must take to test and verify that the equipment is in a zero-energy state. Employers should ensure their MSPs clearly and specifically outline the steps to be followed. Put another way, compliant MSPs provide sufficient specificity to guide the employee through the lockout process. Over-generalization can result in a document that has little or no utility to the employee who must follow the procedure. The real challenge seems to be ensuring LOTO procedure are machine-specific; i.e., they are tailored to each piece of equipment upon which an employer performs service or maintenance. Employers may, however, develop a single MSP for a group of similar machines that have the same hazardous energy source(s) and the same or very similar methods for controlling that energy. If employers are using one procedure for a group of machines, they should consider an inset or note in the MSP that highlights any unique aspects for each piece of equipment (e.g., different locations of electrical sources). Contract work also presents some issues in connection with machine-specific LOTO procedures. If a contractor performs tasks covered by LOTO, both the contractor and host must inform each other of their respective LOTO procedures. But if a host employer never services its equipment in-house, the host need not develop its own machine-specific LOTO procedures. The host employer must, however, ensure its employees understand and comply with the restrictions of a third party’s LOTO program. 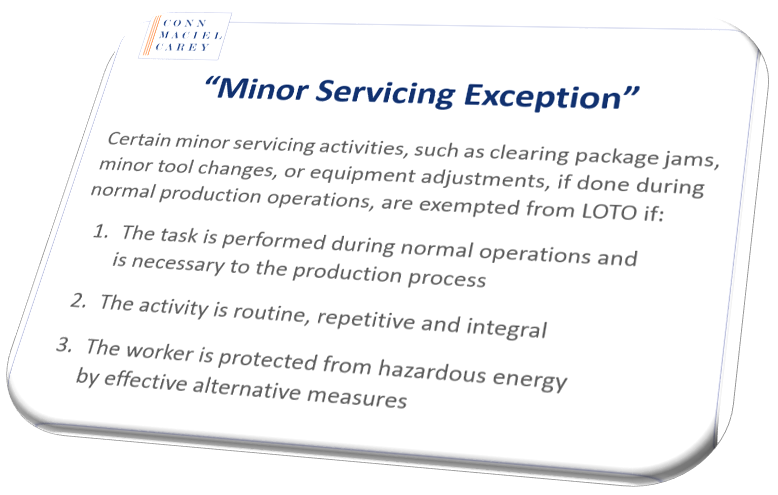 Employers, in addition to having effective machine-specific LOTO procedures, must conduct periodic inspections of each energy control procedure to avoid a citation under 1910.147(c)(6)—typically the second most frequently cited sub-section of the LOTO standard. These inspections must be performed at least annually to ensure energy control procedures continue to be implemented properly, and that affected employees are familiar with their responsibilities under the procedures. Be performed by an authorized employee, but not by the employee using the procedure being inspected. Include a review, between the inspector and the authorized employee, of the responsibilities under the procedure. Be certified in a record that identifies the machine for which the procedure was reviewed, the date of the inspection, the employees included, and the person performing the inspection. The individual conducting the inspection must observe the implementation of the energy control procedures and discuss the procedures with the employees implementing them to determine that the requirements of the LOTO standard are understood and are being followed by the implementing employees. While the designated inspector need not observe every authorized employee implementing every machine-specific LOTO procedure for which he or she is authorized to service, the inspector must observe a representative number of employees implementing the procedures. The designated inspector must, however, talk with each LOTO authorized employee—even those not implementing the procedure during the inspection. Relying on a group meeting—such as a toolbox talk—where energy control procedures are reviewed will not suffice unless actual implementation of the procedure is inspected in real time. Employers can, in the interest of efficiency, inspect groups of procedures provided the employer performs a case-by-case assessment to determine whether the procedures can be effectively inspected as a group. Once the periodic inspections are completed, the employer must ensure any deficiencies or deviations are corrected. The employer must also certify, in writing, the inspection was performed. To comply with the standard, a certification must include the machine or equipment on which the inspection was conducted, the date of the inspection, the employees included in the inspection, and the name of the inspector who performed the inspection. To ensure the inspections are conducted at least annually, an employer’s safety team should calendar the relevant due dates, preferably with electronic reminders/alerts sent to more than one individual. Some employers conduct the inspections every 10 months to reduce the likelihood of an error or omission. Employers should keep in mind that if they have procedures that are used less than once per year, those should be inspected each time they are used. The real rub in getting the minor servicing exception right is understanding, implementing and demonstrating that the measures taking as a substitute to locking out the machine are effective to protect employees from hazardous energy. Note, the standard does not call for the alternative approach to be “as effective,” just that it is effective. Some examples OSHA endorses here are use of interlocks, local disconnects in the exclusive control of the servicing employee, or specially designed tools that keep the employee out of the zone of danger. We have found that employers typically do a very good job of training those employees tasked with performing service and maintenance (i.e., LOTO authorized employees) in the recognition of hazardous energy sources, the details of the type and magnitude of the hazardous energy sources present in the work area, and the specific methods and means to isolate and control hazardous energy (including in machine-specific LOTO procedures), employers often forget to provide LOTO training to other individuals covered by the LOTO standard. OSHA expects employers to also provide LOTO training to individuals who operate the equipment being serviced (affected employees) and to anyone else who may be present in areas where LOTO may be utilized. To satisfy the LOTO standard, training should ensure affected and other employees understand the purpose and function of the energy control program and procedures, know when the procedures are being used, and to be aware of the prohibition against attempting to restart a machine that is locked out. Employers also often overlook the importance of training temporary workers before exposing them to safety and health hazards in the workplace. If it is necessary to assign temporary workers to perform service or maintenance tasks, it is essential that those workers receive the same training given to permanent LOTO authorized employees. Even if the temporary workers are merely operating equipment, or more likely, will work in the area where LOTO is utilized, they must be trained to the level of affected or other employees. Employers should never assume the staffing agency sending the temporary workers provided that training; instead, the host employer should trust and verify, or provide the training directly. Even when the staffing agency has provided LOTO training to temporary workers, the host employer is presumed to have knowledge of unique, site-specific hazards, and so will generally be expected by OSHA to provide additional training specific to its workplace and equipment. In the unfortunate event that a temporary worker is injured, the host employer should expect that OSHA will ask about the training he or she received as OSHA has made the protection of such workers a point of emphasis, since launching a Temporary Worker Initiative a few years back. Employers also frequently botch the Group LOTO requirements. Even if the employer complies with the LOTO standard by ensuring a lockout device is properly affixed to equipment being serviced, a violation can still occur if more than one employee is servicing the equipment simultaneously, and only one employee applies a lock. While primary responsibility for a group/crew of employees must rest with a single authorized employee or supervisor, each authorized employee must affix his own personal lock to a group or gang lock device. Similarly, employers should remind supervisors they must not assume sole responsibility for the lockout device affixed to equipment being serviced; those supervisors must still ensure each employee affixes their own personal LOTO device to the equipment (or to a group lockbox). Even the most diligent employers, it seems, make one or more mistakes with respect to these requirements—often due to an oversight, misunderstanding, or miscommunication. 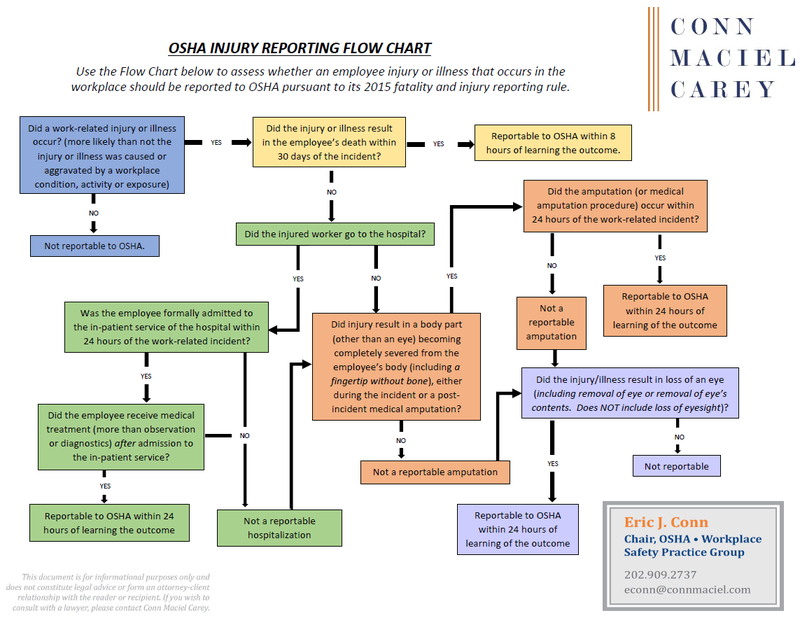 To reduce the likelihood that OSHA will find fault with an employer’s LOTO program, employers should proactively audit every aspect of their policies, practices and procedures, seeking advice from a qualified safety consultant or experienced attorney and acting quickly to correct the deficiencies that are identified.